Having the best is worth the price. When you invest in the ultimate party tent, all of your venue accommodation needs are met with this fully functional tent kit. 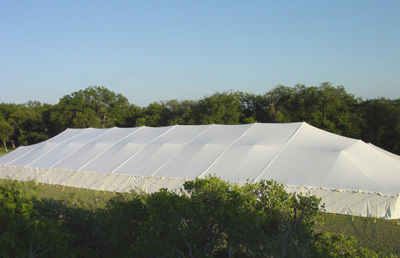 This commercial quality tent is constructed to handle the constant manipulation of event assembly and dismantling. The heavy-duty 15 ounce Block Out top is available in solid white or in a more festive stripe design. Able to withstand wind gusts of 70 mph, the tent is constructed to survive inclement weather conditions. The ultimate party kit includes durable, light weight galvanized side poles, center poles, stakes, and a storage bag. An installation video provides step-by-step instructions.